I’ve found that this is also the case with travel. There are those parents who wouldn’t dream of getting on an airplane with their kid(s), and others who do it all the time. We are of the latter. 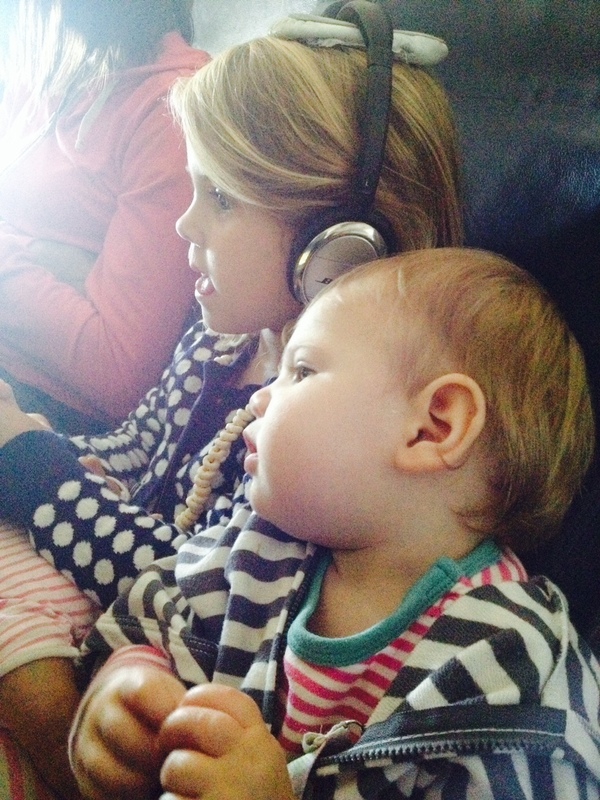 We’ve been traveling with Silvia since she was about 4 months old and Isla earned her wings at 8 weeks. I take a lot of extra precautionary measures to make sure they stay well through the shuffle (because it does means recycled air, germ exposure and often loss of sleep) and so far we’ve been blessed with no major issues. Do what works! Note the shoe to make the headphones fit and the cheerios necklaces. A few days ago I did what a lot of moms would throw me into the asylum for; I traveled ALONE with my two littles. Silvia, I knew, would be a gem. She’s a pro at this, afterall. 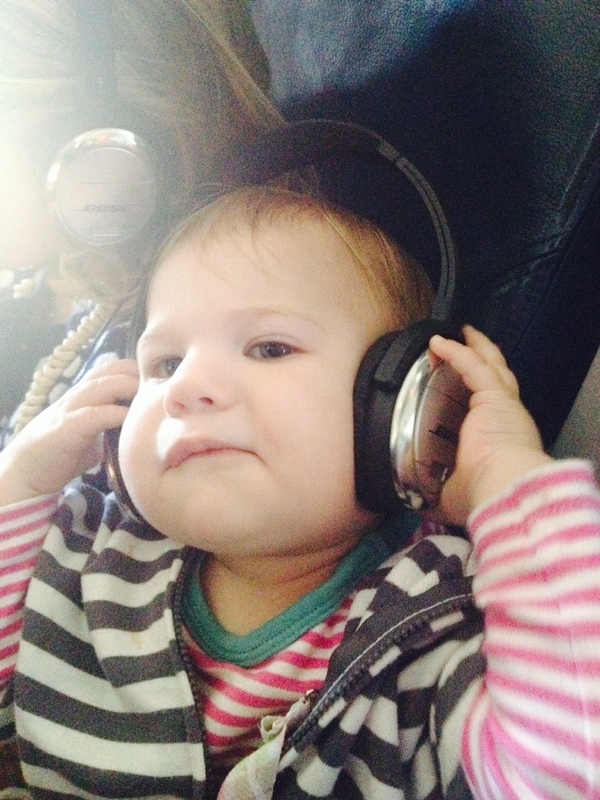 She knows how to put on her noise canceling headphones. How to buckle her seatbelt. How to put up and down her tray table and ask the flight attendant for some apple juice, no ice. Isla is at that “I’m a walker” stage and wants to be constantly on the move. So, she was the wild card. Los Angeles to Detroit. Not the shortest flight possible but far from the longest. Plus we had the promise of Mimi and Papa’s comforts waiting for us on the other side. Isla trying out my headphones. Everything started off great. We made it through security and to our gate without a hitch. (except that Silvia refused to carry her own backpack so I was stuck with Isla in the Bjorn, plus 3 bags across my back and shoulders…I’m still sore from it. We made it on the flight and, though I was worried about the 2 seats in a row of 3 to which we were assigned, a complete and beauty of a mom took up the remaining seat and helped me with things like opening cracker packages and disposing of banana peels while my hands were busy with one or the other. So for four hours we sat, and paced the isles a bit, and sat some more, in relative peace. And then, as I watched the digital airplane make its way closer to our destination on the little seat-back screen, I celebrated when I saw that we only had 20 minutes left in the flight. Silvia was showered with kisses for being such a good helper. Isla was praised for her patience (despite no more than 4 minutes of sleep). My new mom friend was thanked profusely. And I even gave myself a little pat on the back. And then it all went downhill. GROAN. 20 minutes left just turned into 40. I don’t like moving backwards. Cincinnati?! Like 4.5 hours south by car, Cincinnati?! DOUBLE GROAN! But wait…..yes, there’s even more…. By that point our crew had expired and we had to wait on a new crew to come in and fly us on a new plane which, as it turned out, wouldn’t arrive for another 5-6 hours or take off for another 7. So off to negotiate the whole re-booking, stand-by hoping, airport feeding, more dirty bathroom hopping dance. All on my own, with two littles. NOT the best day. And yet, somehow, it was filled with blessings. The woman who helped on the plane and became my partner in the airport. The airport lounge woman who went out of her way to find milk for me to give to Isla. The people at the gate in Cincinnati who were also waiting to go standby on a flight that would still get them to Detroit before the next day, who actually applauded when my name was called because they felt so badly for the woman flying alone at nearly midnight with two small children. The airline man who actually walked all of my bags onto our rebooked flight while I managed two very tired pups. The flight attendant who moved us around so that we could have a whole row to ourselves on that second flight because she could see how badly the girls needed to sleep. So happy to be here. 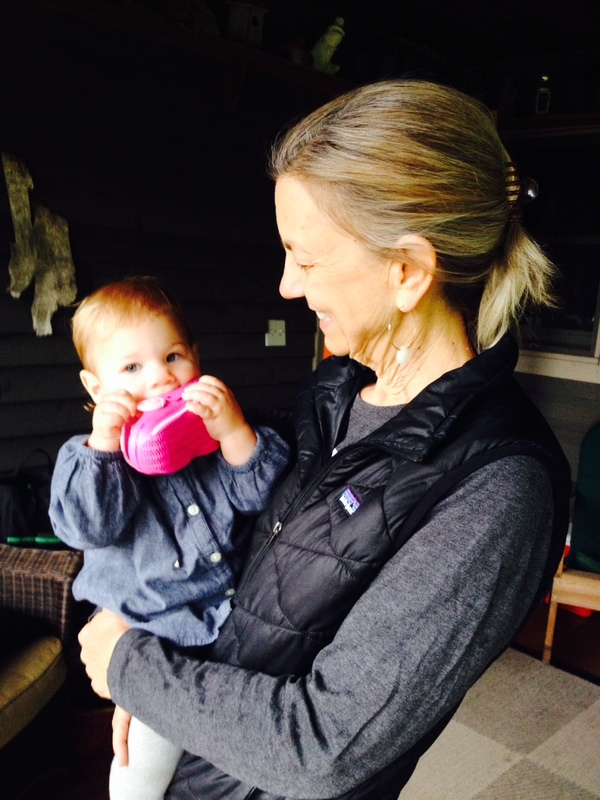 The thing that I’ve found about mothering, is that, yes, it’s about putting yourself aside and sitting so that someone else’s needs (most often a little person) can be met first. But it’s also about opening your eyes a little farther to see the good that’s happening all around. Your babies are growing. They’re learning new words and skills. They’re earning grades in school and achieving athletic markers you could never dream of. That is goodness. And people are willing, more than willing in fact, to lend a hand if only you’ll let them. People are good. Life is hard, but people are good. And I thank God for that. In the end, we made it to Detroit someone just shy of 1:00am. Silvia and Isla ate chicken, brown rice and home-grown green beans in the car on the ride to Mimi and Papa’s (airport food just doesn’t cut it for these two). And thought they didn’t get under the covers until 2am, they were troopers all the way through. Isla didn’t cry one second until the final hour and Silvia stayed chipper throughout. And I…? Well, I chose to step up to the plate and “sit” for my girls. I didn’t cry or moan or get mad at the gate agents who said nothing could be done except to wait for 7 hours. I went with the flow. I assured everyone that it would be fine. And it was. And I think that I was repaid in spades by being allowed to glimpse once again the good in people and the good in my girls so clearly. Beautiful, Sara. Tears of joy for you and all the special helpers along your path. Oh,my goodness, what troopers you all were. I probably would have been off the wall. I have had to do this many times, via 6 to 8 hour ride in a car with one child and that was not an easy thing. Many stops, and promises made and kept. We pray for them being older, but I sure wouldn’t have missed the mishaps along the way. The memories good or bad were all worth it. We do laugh in the end. Thank you for this. Seeing patience in others is a reminder for me to immulate the same. 🙂 Plus, I appreciate the reminder that our children are learning by watching how we react. Love this Sara! 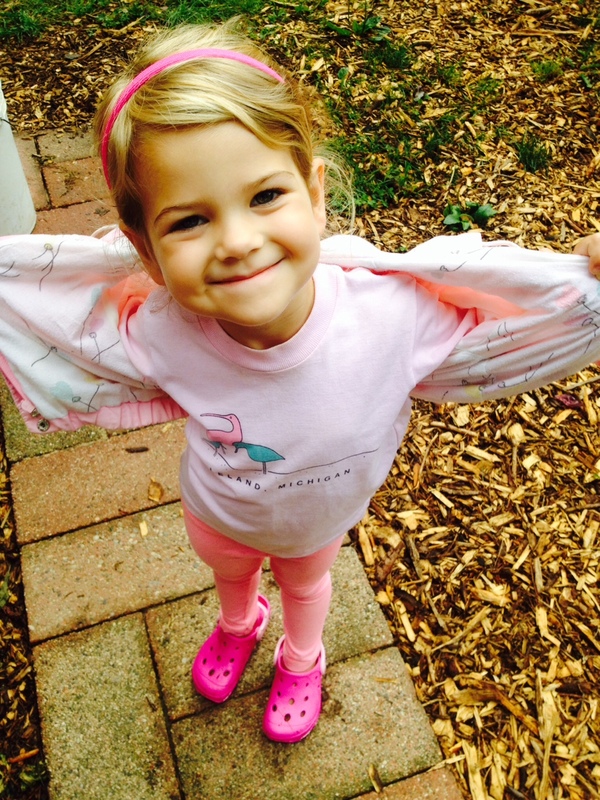 Thank you for writing about flying with children and the many obstacles us Mom’s face. Love your perspective and we all need a reminder to appreciate and rely sometimes on the help of others when offered instead of thinking we are alone and struggling. Thanks so much! What a great reminder in this age of constant “travelanches” that calming breaths and hope that things will turn out alright is the key to pushing forward!